What Causes Nickel Allergy, And What Are The Best Ways To Limit It And Treat It? A nickel allergy is caused by a metallic chemical element called Nickel. It is used in many everyday items. It is a common allergy. In it's pure state it is a silvery colour. It can be melted easily and is hard. This makes it ideal to add to other metals that are softer. It makes them more robust. An allergic reaction isn't caused by the actual metal. When anything containing nickel is in contact with us, our sweat causes nickel salts to form. These salts cause the allergy to develop. Anyone can develop a nickel allergy at any time. It is usual for it to start when someone has their ears pierced. This can be the first time that the skin has direct constant contact with it in some form. Although it can start at any time in life. It appears in around 15% of the population. It is more common in women. Mainly because they are more likely to wear jewellery. There is now a growing number of men wearing earrings and necklaces. So it may soon become more common in men. Another everyday item that can cause a reaction, that is worn by women, is an underwire bra. The wire can contain nickel. 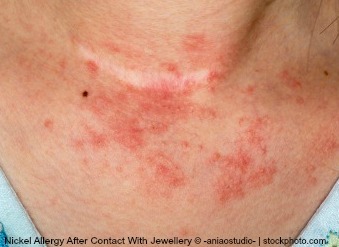 The rash that is caused by contact is known as Nickel Dermatitis. The skin will be affected where the contact has occurred. For instance, on the stomach where a belt buckle has been or around a finger where a ring has been worn. This can help with the diagnosis and causes of nickel allergies. Testing for a nickel allergy tends to be done by a skin patch test. You would be referred by your doctor to a skin specialist, who would be able to do the test. You can also test items to see if they contain nickel. You can get this type of test from a dermatologist or you can buy one yourself. There are several companies that sell them online. You get 2 chemicals which you put on a cotton bud. The bud is rubbed onto the item being tested, If the test is positive, the bud will turn red. There are different tests you can buy. Always read the instructions to make sure you get the right result. Though they all generally work the same way. One way to prevent the symptoms appearing is to substitute items containing nickel with ones that don't. If you are very sensitive to nickel then wearing gloves may help when you have to handle items. Although this is not always practical. So luckily some items can be adapted, e.g. plastic handles for cutlery. With small items, like belt buckles and jean studs, putting clear nail varnish on them helps. As long as you aren't sensitive to that too! If you have a rash from a nickel allergy, treatment normally involves a mild topical steroid. This will help to reduce inflammation, so reducing any itching. Also apply an emollient to the affected area to keep it moisturised. Any treatment will help improve the condition of the skin. But it is still important to limit the amount of contact that you have with an offending item. This will help prevent further flare ups. I am sensitive to nickel. I have only noticed it over the last few years. This may be because I have never worn jewellery. I had my ears pierced when I was a teenager and had a reaction then. I let them close up very quickly after having them done. I can't even remember if we were aware of nickel allergy then. My skin flares up mainly when I wear jeans. The studs and belt buckle have been the cause. I started to coat them with clear nail varnish. It worked for a bit, then the rash reappeared. I then realised I needed to reapply it fairly often. I was also affected by the hooks on one of my bras. Only one of my bras, which is lucky as it meant I just had to throw one out, not a drawer full! I try to limit the amount of time I have contact with anything that may contain nickel. This works ok for me. My allergy is not so bad that I get affected by everything after a short amount of contact. Sometimes you can work out yourself if nickel is a problem. You may notice a rash appears after contact with certain items, or that the position of a rash is where something has had long term contact with your skin. If you suspect you are affected you could visit your doctor or dermatologist. They may organise a skin patch test which will let you know either way. There are many everyday items that contain nickel. Some you will know, and some you may not. You can read about the uses of nickel to find out more.